There are multiple strategies to support risk identification that are very effective in capital projects. From the initial risk identification brainstorming session through ongoing risk identification during project execution, it is easy to get caught up in “checking the boxes” so to speak. We can miss the opportunity to increase team alignment, and ensure every team member – introverts and extroverts – are fully engaged in risk identification for your project. Each individual on our team brings unique ideas and perspectives to the project. The combined efforts of everyone’s analysis and considerations is what drives the most successful project possible. Although we may like to think that all members of a team feel comfortable to share their point of view and feel as though their voice is being acknowledged, it’s often not the case. When it comes to risk management, we tend to have a bias toward strong personalities, specifically those who are more on the extroverted end of the spectrum. Individuals who would consider themselves more introverted slip under the radar, their thoughts often overshadowed by fellow co-workers. It’s not a fault of those extroverted team members, but as project leaders, we must be aware of this tendency, and address this potential blind spot by proactively seeking to engage all members of our team in the risk management process. First, lets define some commonly misunderstood terms. Although “introverted” is often used synonymously with “shy” or “quiet”, this is not a correct assumption. As Susan Cain explores in her TED Talk “The Power of Introverts”, “introversion is more about how you respond to social stimulation”. While more extroverted individuals thrive in environments with large amounts of stimulation, their more introverted counterparts feel most creative and at their mental “peak” in less stimulated environments. If we focus on understanding the individuals on our team, we can better create a zone where both of these personality types can thrive. The most common strategy used in risk identification involves conducting a brainstorming session with both your project stakeholders and subject matter experts. The most effective brainstorming sessions are well structured and led by a strong facilitator that creates a safe environment for all participants. It’s an interactive session that promotes creativity and considers all ideas. It is vital that everyone’s voice is heard – the project team, external stakeholders and subject matter experts alike. Including participants external to the project team helps will push against the risk of “groupthink”, where everyone on the team begins to think alike. Conducting a structured brainstorm session sounds simple in theory, but what is a practical technique to create the right “zone” for everyone that is engaging, inclusive and promotes effective risk identification from all the stakeholders? 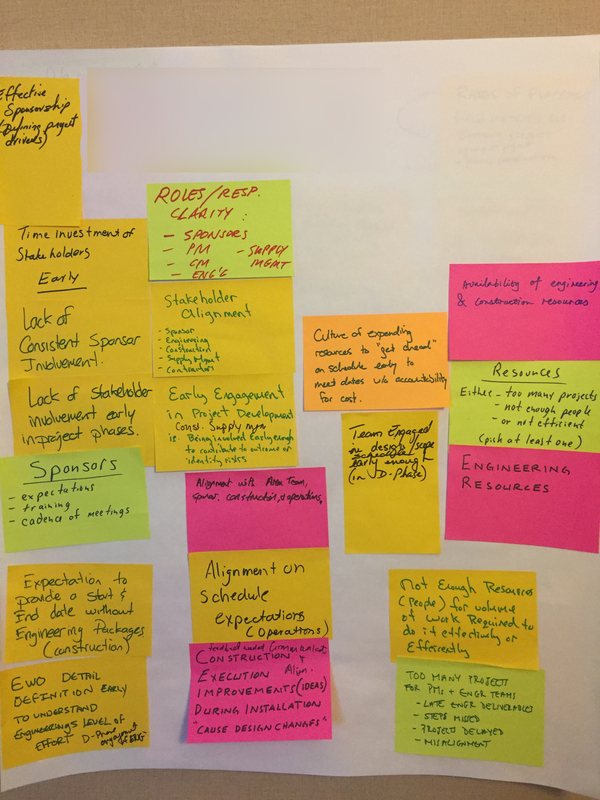 As a facilitator, one of the most effective method of conducting a structured brainstorming session for risk identification is using what I call the “Colored Sticky Note” approach. 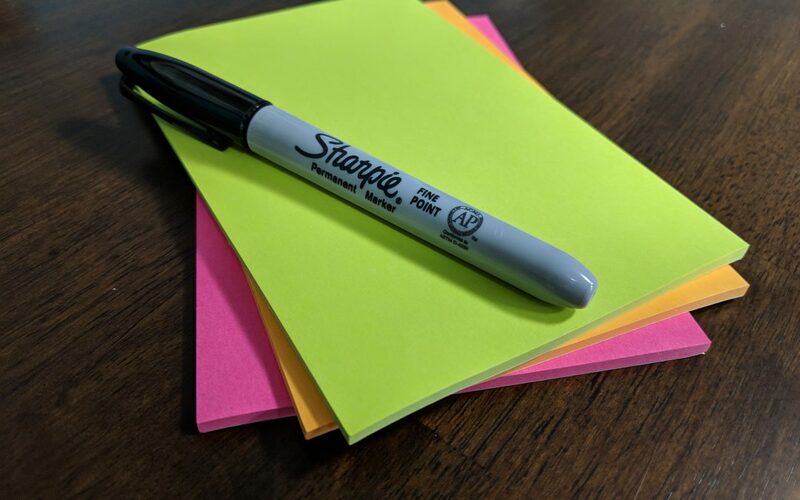 As simple and low-tech as it may sound, when you give a group of experts a Sharpie and a large stack of colored sticky notes, ideas begin to flow in a rapid manner. Here’s an example of the steps I follow to kick of a structured brainstorming sessions. Keep in mind we need a mix of quiet periods (less stimulation, often preferred by the introverts) and interactive periods (high levels of stimulation, often preferred by the extroverts). Give everyone a Sharpie and a thick stack of large colored sticky notes (don’t be stingy…assume everyone is full of ideas to contribute). The objective is to create a safe atmosphere, where everyone knows their input will be valued and wants to contribute. In a matter of minutes, most teams will have 20+ hot button risks on the flip chart with pretty broad coverage. Next, walk through all of the risks on the flip chart with the team. Some sticky notes will have overlapping or duplicate risks. Seek clarification from the group to get their buy-in as you group risks. Some risks will require clarification, and you’ll need to ask whoever created the risk to elaborate. Use your sharpie to add these clarification points to the sticky note. As you walk through and unpack each idea, keep the group focused on understanding the risks, and reiterate that there are no right or wrong ideas – that’s the nature of uncertainty. When you’ve reviewed all of the risks on the flip chart, give the team a short break. Take a photo (it’s easy for sticky notes to go missing), and then move the flip chart paper to a side wall. Repeat this process for each of the risk categories that you’ve selected for your risk identification session (e.g. commercial, project delivery, location, facility operations etc). At Valency, we help train project leaders in practical techniques in project risk management. If you’d like to learn more on how to effectively implement Construction Industry Institute (CII) best practices in project risk management , join us for one of our upcoming Risk Management Principles & Practices courses. Participants don’t just learn the theory behind risk management, but practical ways to engage their team, both introverts and extroverts alike, to take action and manage project risk.